Our Wellspring portfolio is part of this exhibition at The College of New Jersey! Check out the calendar of programing related to the exhibition, and look here for info on when and how to visit the gallery. 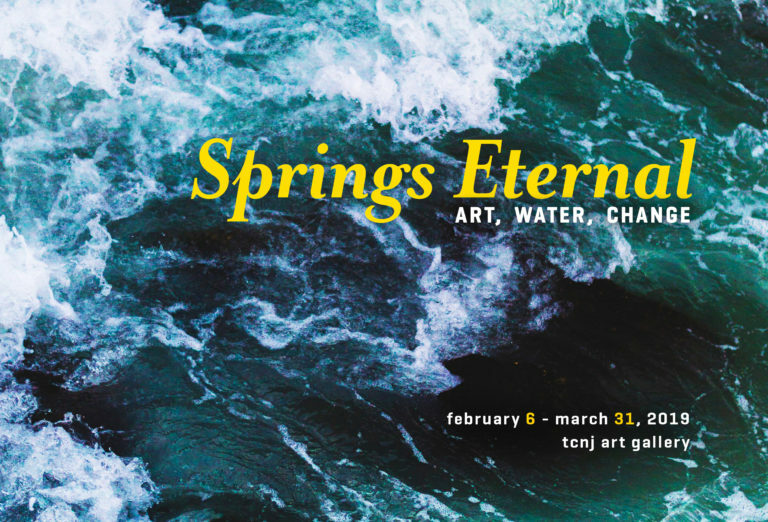 The TCNJ Art Gallery is pleased to present Springs Eternal: Art, Water, Change. The title of the exhibition hints at the missing word that is at the center of much of the work in the gallery: hope. Little of what we read or watch these days about water — whether it is about rivers, ground water, municipal drinking supplies, storm water runoff, flooding — inspires much hope. It can be difficult to rouse optimism about any of the many water-related issues we read about: the acceleration of climate change and rising sea levels, damaging storm surges and flooding, legislative roll-backs of environmental regulations that protected water and air; increasing evidence of damaged freshwater and ocean ecosystems. Yet, the artists in this exhibition all make work about water, and, more specifically, they create work that that seeks to change how we think about, use, preserve, and enjoy water. As an artist, how do you engage an audience with issues that can be complex and politically divisive? How can you productively connect with people when tackling a controversial issue with no easy answers? This requires optimism — and a strategy. Each of the artists (and artists’ collective) in this exhibition has a strategy to connect, to maintain optimism, and to create change. Their hope — or at least their cautious optimism tempered by realistic expectations and belief in creative solutions — for our planet, its water, and its living creatures. springs eternal.